I colored my hair yesterday and was surprised in more ways than I expected. I wouldn’t even be talking about this color today if there wasn’t some kind of promotion so I decided to try it. 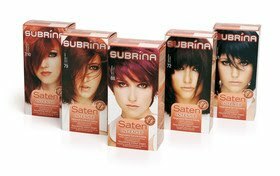 It’s not like it can be that bad, but since this is a Slovenian company and not my usual L’Oreal, Garnier or Schwarzkopf which I trust, I never before bought Subrina (by Ilirija). I know it’s not nice to be prejudiced against small cosmetic companies but sometimes I can’t help it. Anyway, it’s in the lower price range regarding what’s on offer (L’Oreal Preference being higher price range for hair colors here). But truth to tell, I am not disappointed with the color – it does hint toward orange but it’s actually a really strong copper tone. Which is what I aim for most of the time. Only this copper leans more toward orange than red. This will be then the tone of the month – it’s good it’s so lively because the weather here is grey and we had our first snow today! 🙂 Yeey! It was mixed with rain and it’s too warm for it to stick, but I love watching it fall and it has made my gray rainy day much happier. Back to the color. I wanted to talk about it today because I was pleasantly surprised to find that the gloves that come attached to the instructions are much better quality than what can usually be found in the package and that there was more color in the end than I was able to utilize. That has never happened before. I mean, I do have short hair but lately I started asking myself is it possible that they put less and less product into those bottles and tubes because one color is barely enough for my hair. Well, Subrina obviously does put enough which is certainly a plus for them. Another plus is that their instructions say that after washing off the color shampoo, you need to shampoo the hair one more time with a color save shampoo and then apply the conditioner that came in the package. The problem with the conditioner satchet is that it is not perforated which luckily for me, I noticed before starting to wash the color off so I cut the top off. Now, I cannot as of yet say how lasting it will be (I mean they all wash off, it’s just the question of how soon and how much) but it washes of your skin incredibly well enough. Hopefully it will remain this vibrant long (at least the SA said it would). REMINDER: You still have time to win a copy of the latest Stephanie Laurens romance (I mean, who doesn’t want to win a book), just leave a comment saying so here.